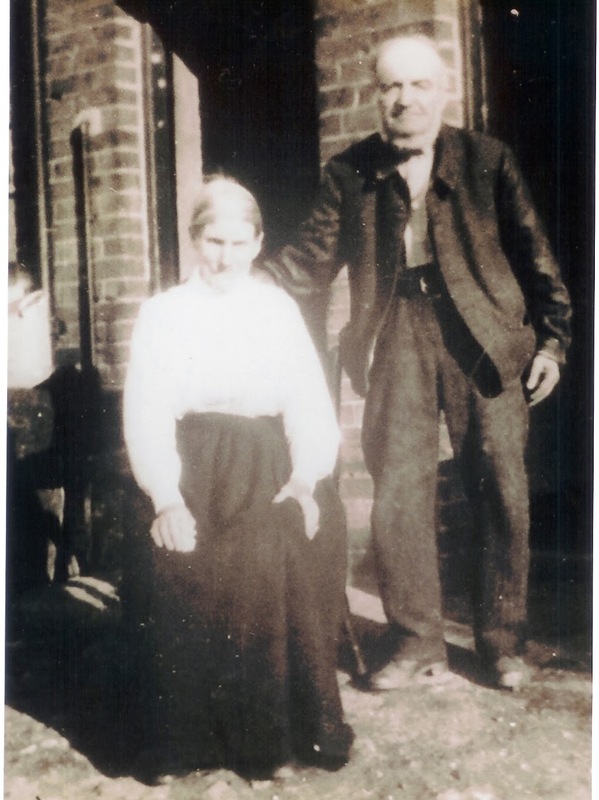 The picture is of my Great, Great Grandparents Henry Harris (1843-1929) and Caroline Harris nee Ellis (1844 -1935). This photograph was taken on the occasion of their 60th Wedding Anniversary in 1924 and was taken at Wanborough Surrey. The background is the Sam Marshall was a local farmer, and was in fact related to Caroline through marriage. Her sister Maryanne married Jim Marshall, the added complication was that the Marshall family were already connected to the family prior to that marriage and things were further complicated when in 1931 Rose married Maryanne’s Grandson Ernest. Something that Caroline disapproved of and my Aunt always vehemently denied. This entry was posted in Uncategorized and tagged Ellis, Genealogy, Harris, sepia Saturday. Bookmark the permalink. Grandpa's 'chin curtain' beard really suits him. And I agree with Joan – the hand on the shoulder is very sweet. I like the photo and the apple story as well! I love cute little stories like that. Grandpa looks like a sweetie in the photo. To be married 60 years and a hand still protectively at her shoulder and a smile on his face. Can't get too much better than that. I love the 'twisted' relationships complication you mention at the end! “scrumping ” but seems like an international past time. My husband tells stories of “stealing” apples around here from orchards when growing up too. Henry and Caroline Harris look formidable, indeed! And such a long marriage — kudos to them! I remember having my backside smacked by a man whose apples we had been scrumping. What he didn't know was that the local policeman could see what happened. In those days it was rough justice if you were caught. Ah, those little “crimes” that they remember, are funny aren't they? My mother has a few of those tales to tell as well. My Great-great-grandfather was a Harris too (and so on, down the line). Caroline looks like she would wear the pants and discipline everyone! Cool photo! They look like a find couple. I bet those apples tasted good. Jo, it is those stories that bring our ancestors alive. I wonder if I take after Great Great Grandma or Grandpa? Great old photograph and 60 years is a marvellous achievement, especially back in those times. Great Great Grandma sounds like she ruled the roost – she who must be obeyed! An ancestor of my husband wrote home that he did not approve of his two sisters marrying their step brothers, with whom they had effectively grown up, but they were not deterred. Very nice doorway photo and interesting story about the apples.